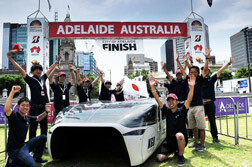 Composites took pole position in the recent Bridgestone World Solar Challenge, the world’s largest solar car race, held in the Australia from 18-25 October. 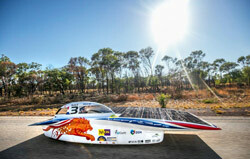 The car race covered 3,021 km through the Australian Outback, from Darwin to Adelaide. The race has a 20-year history spanning 11 races, with the inaugural event taking place in 1987. The objective is to promote research on solar-powered cars. Teijin Group’s OWL, an advanced solar-powered car developed by Kogakuin University using Teijin’s carbon-fiber-reinforced plastic (CFRP), finished in second place. Toho Tenax Co, the core company of Teijin Group’s carbon fibres and composites business, supplied the university with the fabric made with Tenax carbon fibre. The 0.06 mm thin fabric was developed by Toho Tenax together with Sakai Ovex Co., in 2010. GH Craft, also a member of the Teijin Group, helped to design and produce the car body. The race car’s all-carbon-composite two-seater body made with Tenax features an aerodynamic design and weight of 55 kg, which was said to be the lightest among all cars competing in the same class of the race. The body also offers the rigidity and strength to withstand endurance racing and ensure rider safety. Meanwhile another victorious team was the Nuon Solar team and its car reinforced by TeXtreme. In addition to this, teams participating in different classes in the solar race, were also supported by TeXtreme and obtained several podium places. TeXtreme Spread Tow carbon reinforcements were used to reduce weight, improve stiffness and impact tolerance. Nuon Solar Team’s total weight of the Nuna8 car is 150 kg. The total amount of the composite parts of the car using TeXtreme has been developed in cooperation with DSM and weighs in total 41 kg, which is a reduction of 10 kg from its predecessor. In the Cruiser Class there were two solar cars on the podium reinforced by TeXtreme, which is marketed by Swedish company Oxeon AB. The firm says its TeXtreme is also used by cars in Formula 1, America’s Cup, NASCAR, Le Mans, Indy Car, bicycles, ice hockey, golf, tennis, surf boards, table tennis, rowing shells, canoes, skis, snowboards, as well as various industrial and advanced aerospace applications.